When Mike and I were dating during the winter of 1967, we drove out to the Airport. Mike had mentioned to me that The Airport Cafe had very good sandwiches. He was right, so over the years we made the Airport Cafe one of the places we would go for lunch and conversation. 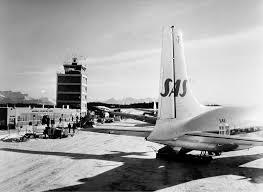 The airport was built in 1951. Mike's dad, Ray Dougherty, was a heavy equipment operator and had helped clear the land for the airport. Of course, that made it even more special to have our lunches there. So many historical things happened as we sat at The Airport Cafe over the years. The first one was when the soldier's were returning from Viet Nam. Anchorage was their first stop in the United States. It was quite a memorable sight to see all the solder's coming off the planes, unshaven, unwashed and tan from being out in the sun. Mike told me that they would go into the men's restrooms and use the sinks like a bathtub. A second memory was with our good friend Alex. We were all sitting in the cafe at a booth enjoying our lunch and our waitress walked over to our table. She had a very sad and bewildered look on her face. She said she just heard on the radio that Robert F. Kennedy had just been shot in a hotel kitchen. We didn't know what to say. We just stared at each other. Mike and I and Alex finished our lunch and quickly went to the car and turned on the radio. We listened to the unbelievably sad news on the radio and slowly drove away. Now, this third memory is from June 8th 1970. Mike and I were married on June 7th and were heading to Southern California and Hawaii for our honeymoon. Our families and friends treated us to breakfast at the airport. We said our good-byes and they all wished us a happy honeymoon. Later, Mike and I were on the airplane and in our seats when a stewardess asked if we were Mr. and Mrs. Dougherty. We replied yes and from her cart, she handed us a decorated sheet cake. It had little plastic palm trees, hula girls and surfer dudes on it. What a fun surprise! Our families gave this gift to us to have on the plane and to share with my brother Bobby and his wife Maria when we landed in San Francisco. Airports are at times happy places, but they can also be sad places. I know that Mike and I experienced a few of those happy and sad times at the airport. Mike and I have often talk about our dating years and recall our good lunches and great conversations at the Anchorage International Cafe, planning our future together.